My friend came over early one weekday morning and I made this. I didn’t end up having lunch that day because I was so full. This is definitely a brunch dish and something I will make again on a weekend. This is breakfast for two. Peel the potatoes and chop them into cubes. Place them into a large pot of cold water, add a tablespoon of salt. Once the water starts boiling, parboil the potatoes for 7 minutes, then drain in a colander and leave to steam dry. In a frying pan on medium heat add the chorizo and fry. Once some fat from the chorizo had rendered, add the onion and garlic. Fry until the onions have softened. Add the red peppers. Fry until softened. Remove vegetables and chorizo from pan. Add the olive oil. Add the potatoes and cook for 10 minutes until potatoes are crispy on the outside and soft in the middle. Season with salt and pepper. Add the chorizo and vegetables back into the pan and mix with the potatoes. Remove from pan and put on two plates. Fry eggs in the same pan. Add a little more oil if needed. Sprinkle with salt and pepper. 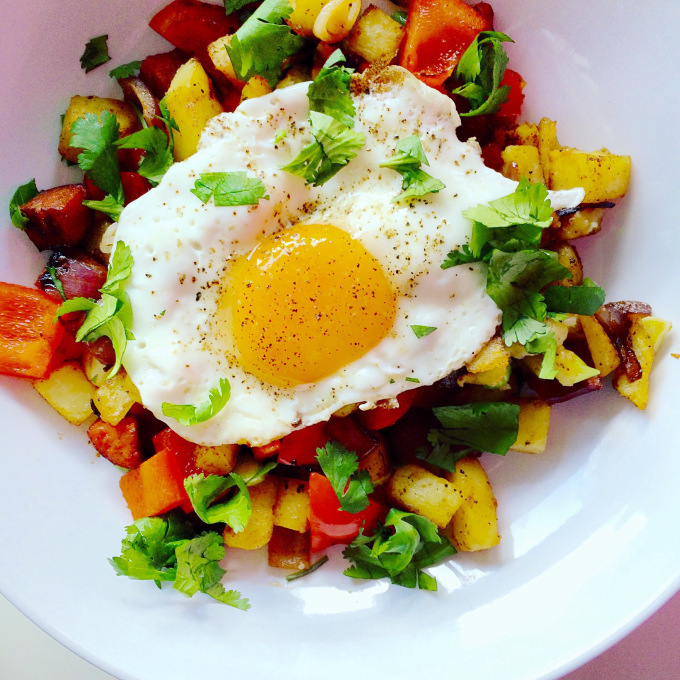 Place an egg on top of the chorizo hash. I love cilantro and used it as an ingredient rather than a garnish. It gives this dish a brightness and freshness which is nice with the warm vegetables and spicy sausage. But if you’re not a fan of cilantro, you can use a little like a garnish or use parsley. deeeelicious!! it was everything I needed and more!!! I’m trying to convince her to make it again…only this time for dinner.